There are hotels in Kuala Lumpur for all budgets and tastes, from top international hotel chains to hostels. 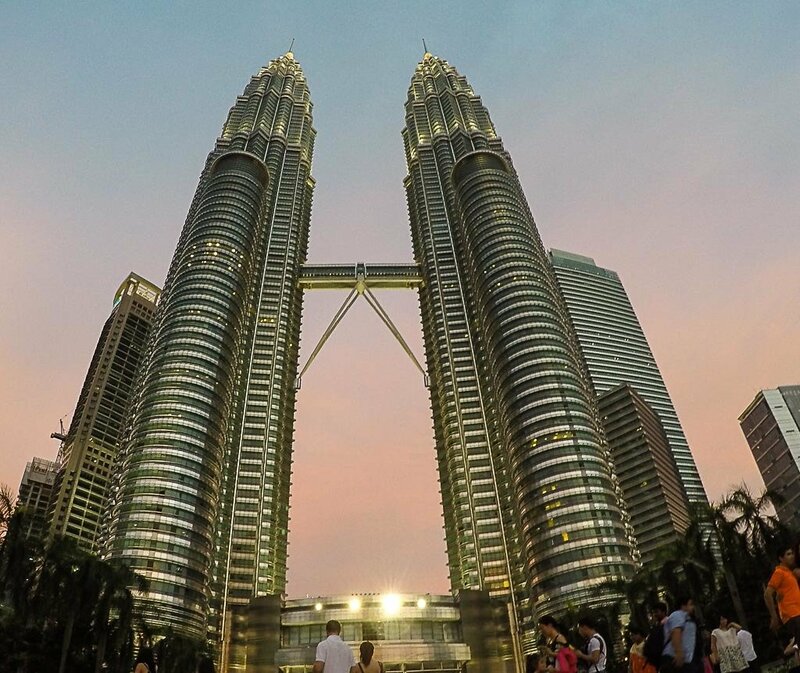 If you are looking for a fancy stopover in Kuala Lumpur you should stay in one of the hotels around the Petronas Towers. For a truly lavish experienceTraders Hotel and the Mandarin Oriental are great options. For those traveling to Kuala Lumpur on a budget, the hostel Back Home KL has good reviews and the location is great. 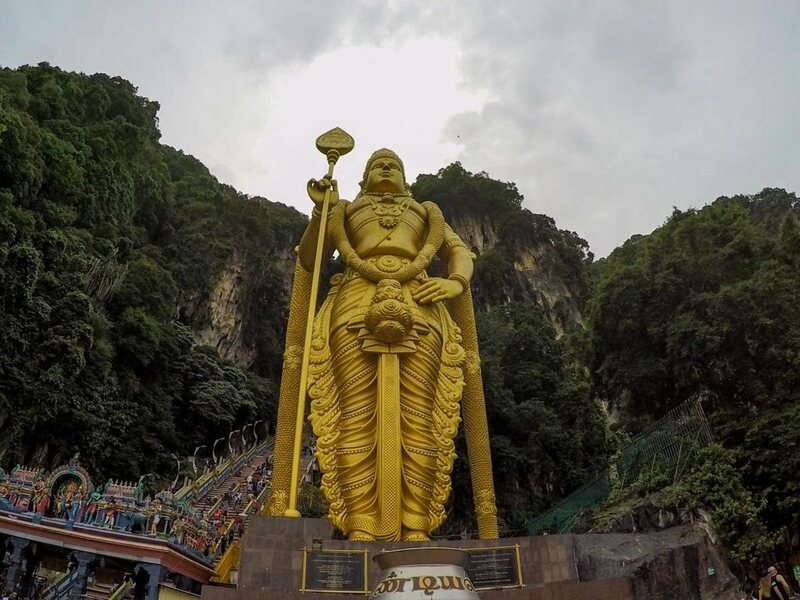 The Batu Caves are famous for its natural beauty and for the Lord Murugan, a statue with 42.70 meters height that stands beside the huge staircase (272 steps) that leads inside the cave. Be careful with the little nasty monkeys that will follow you climbing the stairs. They are looking for food, and they will steal everything that looks like a bottle of water or plastic bags. Please, don’t feed them!! Their bad behavior is a consequence of irresponsible tourists that feed and try to pet them. 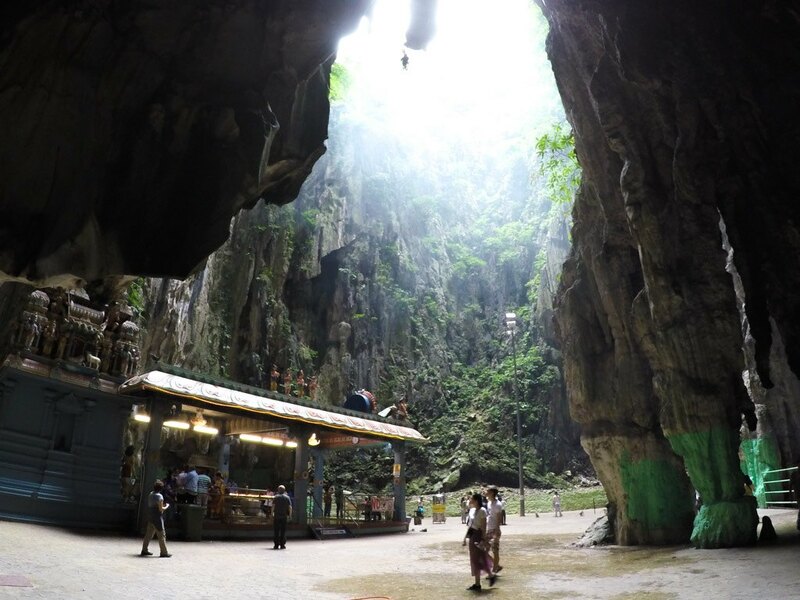 Once you finish visiting the Batu Caves jump on the train and go back to town, there are more great things to do in Kuala Lumpur in one day. 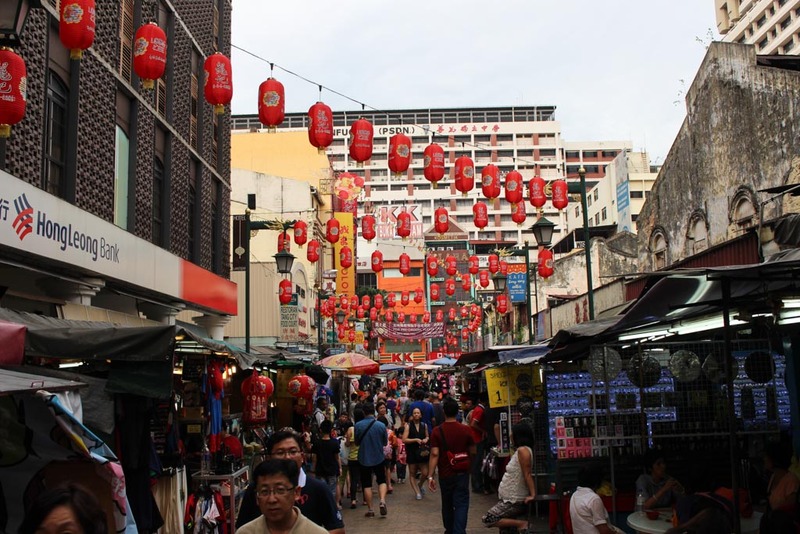 A day trip to Kuala Lumpur won’t be complete without a stop at the busy Petaling Street, the heart of Chinese community in KL. It’s one of the most visited places in Kuala Lumpur and the reason is simple: good street food, cheap stuff and a fun atmosphere. If you decided to buy something don’t forget to bargain. When you get tired of haggling and eat Chinese delights catch the LRT Line 5 and stop at KCLL. Mind your time and try to leave the Chinatown before 4 PM, so you have time enough to visit a few other attractions before the sunset. 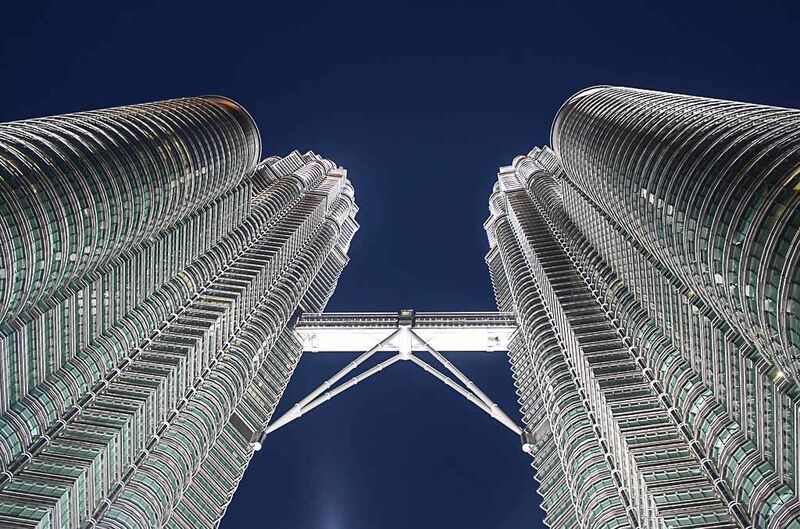 The Petronas Towers are the symbol of modern KL and one of the attraction you must visit. The 88 story identical towers were the tallest building in the world until 2004. The Islamic-inspired building has a Sky Bridge on the 41st and 42nd floor where you can go and have a privileged view of Kuala Lumpur skyline. If you don’t feel like going so high, or you are on a tight budget and don’t want to buy the entrance tickets don’t worry, the view you get from the bottom of the towers is incredible too. Inside the building, a huge mall is a truly shopping paradise with international brands and some upscale boutiques. The Sky Bridge is only one of the great viewpoints in KL, if you want to have a birdseye view of the city you can also visit the Menara KL Towers, a 421m high telecommunications and broadcasting tower that has an observation deck on the top, a restaurant and many other activities for visitors. 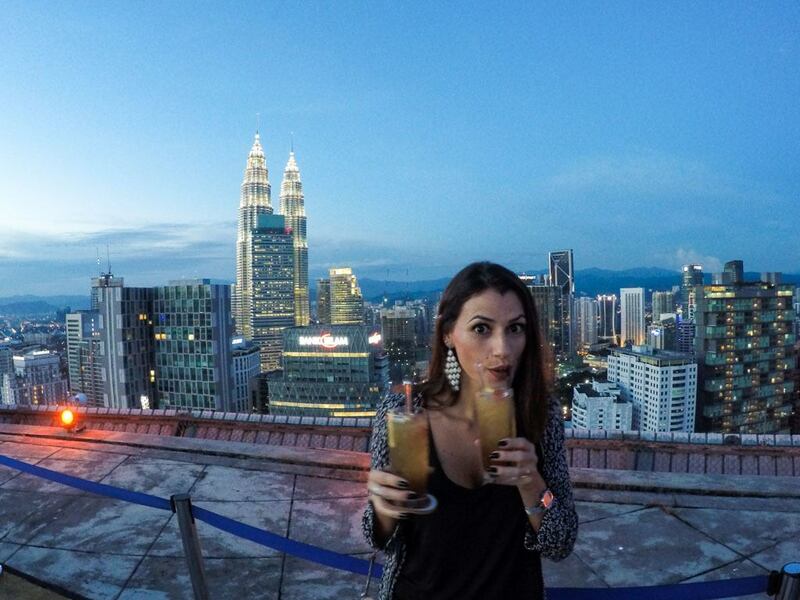 Now that you already saw the skyline during daylight, it’s time to be hypnotized by KL’s night skyline, to finish your first day in Kuala Lumpur nothing better than sunset drinks on a rooftop bar. There are many rooftop bars in Kuala Lumpur, the most famous one is the Sky Bar at the 33rd floors of the Traders Hotel. If you have time you can go during the day and enjoy the swimming pool with a great view to the Petronas Towers. But if you want to have a unique experience, the place you should go to celebrate your one day trip to Kuala Lumpur is the Heli Lounge Bar! This aviation themed bar must be on your Kuala Lumpur itinerary. Located on the 34th floor of Menara BH Building, it has a beautiful view from the Petronas and KL towers. But the greatest thing about this bar is that the tables are set on the helipad of the building. Yes, this is true!! You can sip your cocktail and enjoy the sunset literally from the top of the building, without a roof over you or a wall around. It’s the best 360º Skyview e in KL. We went to the Heli Lounge Bar for the sunset and to celebrate my birthday, it was magical! To witness the city light up is a great experience, something you should not miss on your day in Kuala Lumpur. If you are afraid of height don’t worry, the bar is actually on the 34th floor with walls and windows, the helipad is one more space of the lounge where you can relax and enjoy the view. To wrap up your day trip in Kuala Lumpur nothing better than a delicious dinner. Our Kuala Lumpur itinerary finishes at Bukit Bintang area, famous for local food, international restaurants, and trendy bars. Be prepared for a feast of flavors, busy streets and vendors trying to convince you they have the tastiest food, the coldest beers, and best music. The vibe at Jalan Alor Street is very relaxed and it’s packed with tourist. If you want to try Malaysia traditional food this is the place. There you find Malay recipes, Chinese food, Indian, fresh fruits, and seafood. 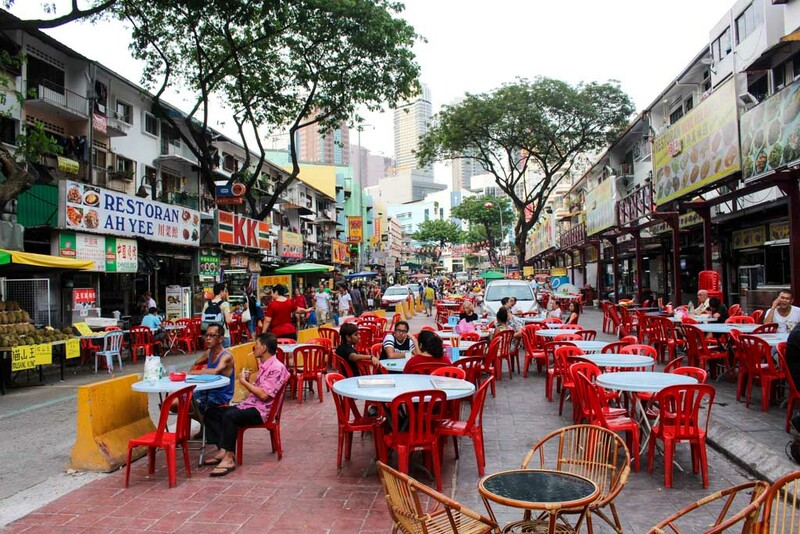 If you don’t feel courageous enough to try the street food [what is really good, believe me] head to Changkat Bukit Bintang Street for a big variety of resto-bars. My birthday dinner was at the Pinchos Tapas Bar, so far one of the best Spanish food we had in Southeast Asia, great selection of wines and beers. If you want to add an international touch to your one day visit to Kuala Lumpur go to Pinchos or any other lovely restaurant in that area. If Kuala Lumpur is the start of your trip in Malaysia, check our posts about Langkawi, a stunning island in the Andaman Sea. Green mountains, waterfalls, pristine beaches and adventure. We have been there twice and loved that little paradise. 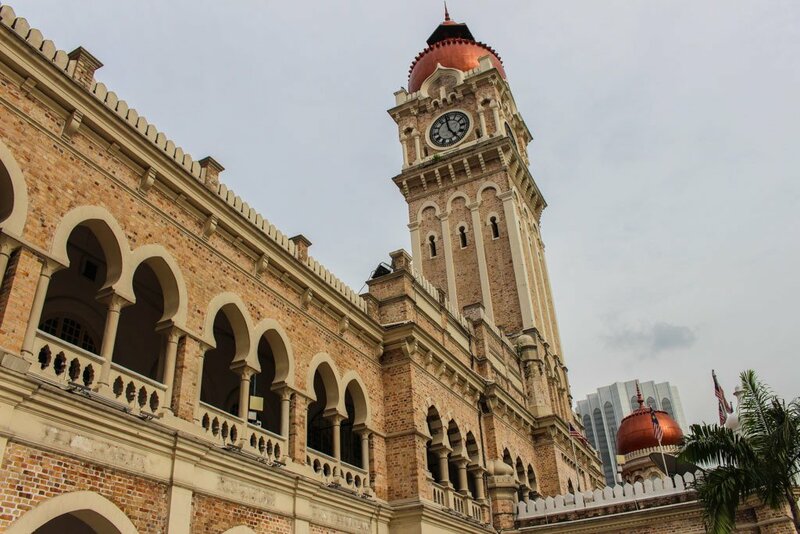 Follow our itinerary suggestions and visit Kuala Lumpur in a day. 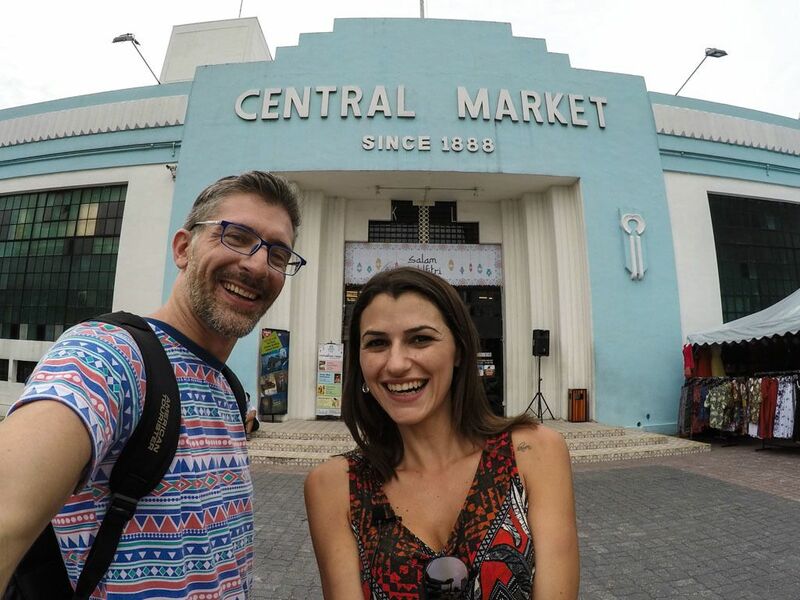 Your day trip to Kuala Lumpur will be busy with beautiful places and tasty surprises. 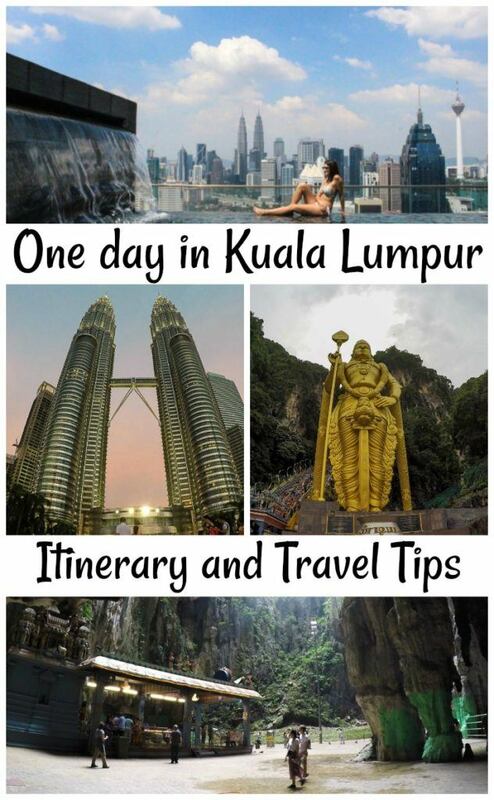 So when it will be your day trip to KL? Share your travel plans and experiences with us! will go to Malaysia on 10 july, i love Genting Highland, it is a very beautiful hill station. happy to see your blog. will be travelling to KL this december. will it be okay to do side trip to Colmar Tropicale French Theme Resort after batu caves? or is it very far? It will take about 1 hour driving depending on traffic. Not sure if you can get there by public transportation. Nice and beautiful country. I have visited many times but the only problem here is crime. There are various modus operandi groups targeting the tourists. I with my family were robbed by local goons posing as police officers and took around 3000 usd. Just be careful everywhere. Sad to hear about it, unfortunately we need to take care everywhere. Hey… Thank you so much for your time and post. It helps a lot. May I ask you a question that how the toilet facilities are there in KL. Is it western type or Asian type and how can we find the toilets in public places.. Yes, you can find western toilets as well. Keep an eye for Shopping malls, cafes or restaurants. Yes, half day is enough. The Best Time to Visit Liberec is Now!